A Remarkable Man -  An epic journey of new discovery so fantastic that our natural instinct would be to block it out. To receive your Daily FREE Inspiration visit: www.prosveta.com. “Life is our most precious possession. Let your material life be consistent with your spiritual life. Dedicate your life to a sublime. Our daily life purpose a matter that must be transformed by the spirit. Respiration is of paramount importance to anyone who aspires to an active spiritual life, so you should make sure that your day's activities allow you to do your breathing exercises in the morning, on an empty stomach. while you count to four. 3. Close your right nostril and breath out through the left nostril to the count of eight. Then begin again, starting with the right nostril closed. 5. Hold you breath to the count of sixteen. 6. Breath out through the right nostril to the count of eight. Do this six times for each nostril. Once the exercise has become easy for you, you can double the time of each movement, counting eight, thirty-two and sixteen. But I don't advise you to go any further than that. Breathing can reveal great mysteries to you, but only if you accompany it with some mental work. … As you do this, you will begin to discover the ebb and flow which is the key to all the rhythms of the universe and, when you become conscious of this movement within your own being, you begin to enter into the harmony of the cosmos and establish a relationship of exchange between yourself and the universe. Omraam, like many great leaders, had a humble beginning. He was born prematurely on a very cold winter night in a drafty farmhouse in Serbtzi, Macedonia. His mother had the village priest baptize him within a day because she feared he would not live long. She named him Mikhael. Now, the priest who baptized him had a reputation for being a tea totaler, except for communion wine. But when he baptized Mikhael, the light that descended was so powerful that he felt like celebrating, and during the party afterwards, he got a little drunk. He told people that he saw a vision of Mikhael's future and prophesied that he would do a great work for God. France has the rooster as its emblem, and that is where Mikhael traveled to from Bulgaria, a Balkan country. Also the rooster is associated with the rising sun and vigilance, both of which are important concepts in his teachings. The eagle also represents the lofty sun a fitting symbol for Mikhael, who boldly soared in the diension of Spirit, close to the source of all light. If you read any of Omraam's books you’ll find that they’re full of imagery and easy to understand. Mikhael came to France in 1937. His mother, Dolia Aivanhov never yelled at him or forced him to do anything. Instead, she patiently explained his options and what consequences they would bring and left it up to him to decide which course to take. Mikhael had a profound love and respect for his mother and for all women and saw in them hope for a better world through prenatal education. He said “A mother can accomplish great miracles because she holds the key to the forces of life.” His mother died in 1973 at the age of 97. His father was also an important influence during his formative years, but he died of pneumonia when Mikhael was only seven. Other people who helped shape his character were his grandmother and a wise old man, also named Mikhael, who would tell stories. Mikhael said of him “He would tell me fantastic tales of battles between the forces of good and evil, the powers of light and darkness, and good always triumphed over evil in the end. Ever since, I have felt that by means of these tales this old man and my grandmother gave me an impetus towards the good and the light, and gave my heart a yearning to see the triumph of light over darkness.” Mikhael realized that the moral lessons he imbibed through these stories were more character forming than anything he later learned from books. “Childhood,” he noted, “determines the whole of one's life. Deunov was a remarkable man. He came to America in 1888 and received a doctorate in Theology from Boston University in 1893. He returned to Bulgaria and was offered a ministry, but rejected it in favor of spending four years in seclusion doing spiritual work. On March 7, 1897, Deunov became known as the Master Beinsa Douno, which means The One Who Brings in the Good through the Word. Mikhael also experienced a similar initiation when he traveled to India in 1960 and became known as the master Omraam. In 1918, Deunov established the School of the Universal White Brotherhood. The White referred to the white spiritual light that imbued the auras of its members. Some of the spiritual exercises of this school were prayer, music, deep breathing, sungazing, and paneurhythmy (dance). For twenty years Mikhael studied under Deunov. At the same time he studied at the University of Sophia, concentrating on psychology, philosophy and the natural sciences. During the 1930s, he held a professorship at a university and subsequently became a college principal. In 1937, Deunov seeing the rise of fascist and communist regimes, decided to export his teachings to Western Europe. Out of 40,000 disciples, he chose Mikhael to take his teachings to France. So on July 22, 1937, during the Universal Exposition, Mikhael arrived in Paris with only a handful of French disciples to help him. For ten years he worked hard to spread Deunov's teachings and in 1947, he created the French chapter of the Universal White Brotherhood. After Deunov died in 1944, Bulgaria was taken over by the Soviet Union, Deunov's estate in Sophia became part of the Soviet embassy and the Universal White Brotherhood of Bulgaria was infiltrated by Communists who turned it into a political group. They sent 47 members to Paris to do the same with Mikhael's group, but he firmly resisted. In order to get Mikhael out of the way, the communists used a hypnotist by the name of Cherenzi Lind to discredit him. Lind hypnotized several young ladies into believing Mikhael had raped them. Based on their false testimony, he was arrested, held in prison for several months and convicted on July 3, 1948 after a hasty trial. An appeal was filed but he was sentenced to four years in prison. He was released after two years because of his impeccable behavior. His fellow inmates appreciated the spiritual help they received from his example and the advice he had given them, and called him their “angel.” In 1962 his case was reopened and his name cleared. In the summer of 1953, the first convention of the Brotherhood was held at the Bonfin near Frejus. It was attended by all those who, in spite of the difficulties of the past five years, remained true to Brother Michael. The Bonfin is still the international headquarters of the Universal White Brotherhood and people from all over the world attend conferences there. A tradition which Brother Mikhael began and which people continue at the Bonfin and other centers today is the sunrise meditation. The place where everyone gathered to meditate was a large rock outcropping overlooking the Mediterranean. Mikhael said that it was one of the places that the great adept, Apollonius visited in his travels. Researching the life of Apollonius, I discovered that Southern France was indeed one of the places he went to, and that wherever he went he hid special talismans in the earth. These talismans created a positive forcefield to attract spiritual people and good events. I suspect one of these talismans is at the rock. However, Mikhael said that working directly with the sun through prayer and contemplation was much more powerful than any talismanic magic. In 1956, Mikhael gave a lecture in the city of Nice, not far from the Bonfin. After the lecture, an Indian man approached him and told him that his master Babaji had heard about him and would like to meet him. To be granted an audience with Babaji is a great honor reserved only for those who are pure of heart and selfless. Mikhael wasn't able to leave for India until February 11, 1959. While in India, he visited numerous ashrams, sacred sites and met spiritual leaders. He was welcomed by several famous Hindu and Buddhist sages as an accomplished master from Europe. One master said he was the re-embodiment of Vyasa, who simplified the Vedas just as Mikhael simplified esoteric Christianity. Another adept hailed him as a "solar rishi. 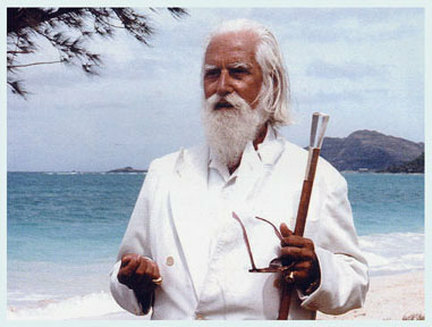 And the master who gave Richard Alpert the name Baba Ram Dass gave Mikhael his spiritual name, Omraam. Finally he met the bodhisattva, Babaji, who in 1992 gave his blessings to another teacher sungazing Hira Ratan Manek. A bodhisattva is a being of high attainment who has such great compassion for suffering humanity that he has taken a vow to not ascend back to God until everyone is enlightened. So Babaji's been around for a long time. When someone meets Babaji he is transformed, and Omraam was no exception. Actually his transformation was more dramatic because of the many other masters he met who gave him their blessings and the many days he spent meditating in sacred places. On his return from India, his whole being radiating a new aura of authority, much like Moses did when he came down from the mountain. In a lecture soon afterwards he spoke about his new name: “The name Omraam combines the two processes of solve and coagula. ‘Om’ dissolves all things, rendering them subtle and fine. It is the sound that disintegrates all that is negative. It corresponds to the solve of initiatic science, which returns things to their source by transforming them into light. The vibrations of ‘Raam’ have the power to condense and coagulate divine realities and make them tangible. “On the physical, material level, the sun is the door, the link and the medium thanks to which we can make contact with the Lord… Through the sun, we work with God Himself... If you want to create a bond between you and the Sun, you have to look at him in all consciousness. This message is basically the same as that of all the masters and cosmic beings who taught the mysteries of the sun – and that is: become a sun of god. The inner, individual work, however, must be seen within a broader, more universal view: it opens our consciousness to the fact that we are citizens of the cosmos, members of one great human family, one universal brotherhood. We are all sons and daughters of the same creator. Very specifically, the teaching of the Master Omraam Mikhaël Aïvanhov invites us to participate in the realization of a new Golden Age on Earth. “I have known the mystical way: The heart, feelings, sensations and love. I have known the spiritual way: Study and knowledge. through work and exercise of the will. and in each I have achieved results. "You will understand what love truly is when you stop thinking of it as a feeling. To love is not to have a feeling for someone but to live in love and do everything with love - speak, walk, eat, breathe, study with love... Love arises when we have brought all our organs, cells and faculties into a state of harmony, so that they vibrate in unison in light and peace. So love is a permanent state of consciousness. Those who have attained this state of consciousness feel their whole being imbued with divine fluids, and everything they do is a melody."